In Japan, there is a practice of shinrin-yoku or forest-bathing, which is a leisurely walk in the forest to reduce stress and improve one’s well-being. It’s like aromatherapy, but instead of inhaling a blended oil, you inhale the natural scents of the forest. But what if you forest-bathed surrounded by millions of bluebells? It’s something that you can experience every spring as the wild hyacinth bluebells turn the Hallerbos, a forest in the municipality of Halle, 30 minutes south of Brussels, into a blue colored, intensely perfumed fantasy. Bluebells have a delicate scent of green leaves, cloves and lemony roses, but when all of the flowers burst into bloom, the fragrance in the air is rich and heady. Imagine the fragrance of hyacinths at your local florist, dilute it with green tea and rainwater, add a dash of autumnal leaves, and you have the perfume of the Bluebell Forest. The Hallerbos in Flemish, or Bois de Hal in French, is a nature preserve and one of Belgium’s best kept secrets; it’s worth coming to Brussels in the springtime for a visit. Access is free of charge, and in exchange, visitors simply have to abide by the rules–not to wander off the marked paths and not to pick flowers. In the early spring before the forest canopy is covered with leaves, sunlight pours through the branches and turns the pale blue of flowers into a vivid bluish purple. If you select the right weekend, the bluebell carpet spreads as far as the eye can see, circling around the slender trees, running into the valleys and massing around the creeks. Up close the flowers look slender and exquisitely delicate; from a distance, they form a blue haze that gives the forest a fairy tale quality. After wandering the narrow paths of the Hallerbos, I return home feeling rejuvenated and refreshed. The blooming season for bluebells is fleeting, and we usually enjoy it for only a couple of weekends before the forest dons its usual plush green coat and wipes out all traces of blue. The memory of bluebells, however, is enough to sustain me until next spring. Of course, for a great forest bathing experience, you don’t need bluebells. You just need an enclave of nature and some time during which you promise yourself to empty your mind of all worries. This is one instance when I encourage you to forgo perfume completely, because even in a city park, you’ll find enough interesting scents–leaves, bark, flowers and wet soil. Nature is still the best perfumer of all. *The Hallerbos can be reached by public transport: TEC bus 115A travels between Halle and Braine l’Alleud, and your stop of choice is Vlasmarkt. Take Vlasmarktdreef into the forest. Otherwise, it’s a 20-30 minute car ride from Brussels. You can obtain information about Halle by consulting the website or by calling the tourist office at (32) 02 356 42 59. The usual blooming times are between late April and early May, but this year, the bluebells are two weeks ahead of schedule. I would love to hear of any parks or nature preserves in your area! Bea: What a lovely description, Victoria! I feel like I am right there with you. I grew up in the countryside in Sweden and spring to me is when the ground is covered with wood anemones, usually in mid May where I come from. After months of snow and then brown dry grass and old leaves, it is magical when everything becomes light green and you can see a white rug of anemones between the trees. I am very new to scents, so this year I am looking forward to sticking my nose into the ground and discover what anemones smells like. Victoria: Your description is enough to make me long for a trip to Sweden. I love the northern type of forests for their sudden transformation in the spring. For months, the soil is cold and hard, and then suddenly, it all bursts into bloom. Cornelia Blimber: Wonderful article and magical pictures! ”Nature is the best perfumer of all”–so true. My favourite nature: the cornfields in Limburg, the south of the Netherlands. The smell of fresh corn is unique ( an echo of it is in a glass of Pilsner beer).Some flowers in the fields don’t smell (cornfowers, poppies) but the ”leeuwenbekjes” smell delicious. (I need Austenfan for the English word). Now I live in Amsterdam and the watery nature of the North doesn’t speak to me. But there is Artis, the Zoo. The fate of the animals is a subject for discussion, but the plants, the flowers and the trees are wonderful. There is a tree with perfumed, lily-like flowers, there are shrubs with yellow, smelling flowers (not mimosa, but Champs Elysées, my Artis perfume, comes near), there is jasmine, and in the ”Butterfly Garden” there is more jasmin and ylang ylang. And they have roses as well. The most beautiful smell comes from the ”Clerodendrum Trichotomum”-sweet, overwhelming. My absolute favourite is alas a memory: the jasmine with big flowers in Rotterdam, disappeared. Cornelia Blimber: I collect the fallen leaves and lay them on my bookshelves to profume them. Cornelia Blimber: that’s interesting information, thank you! Sandra: This article comes at a perfect time for me-though I can’t get here-just reading this makes me feel peaceful. Here in the concrete jungle, there is not too many places like this. In the bronx, there is Wave Hill which is nice. Fort Tyron park, has a great view of the hudson. When I mentally want a place to feel more grounded and have a forest bath, I think of when I lived in San Francisco, I use to travel to Vajrapani in the santa cruz mountains, the smell of the red woods, driving through eucalyptus trees, bathing in the outdoor showers, the burning insense in the temple. Ahhhh..bliss! Zazie: shinrin-yoku: love the idea! Victoria: A friend is traveling through Texas right now, and she sent me a photo of wild lupines the other day. They look beautiful individually, but a whole field of them is spellbinding. Anna in Edinburgh: Beautiful theme, Victoria, and superb photos to accompany it. I agree about leaving off perfume when visiting such fragrant places – that’s what I do when I go to the Royal Botanic Garden here, where there’s always something scented to enjoy. Kathy Bible: Wow, what an amazing and beautiful place. I hope to visit it someday. It must be absolutely magical. It looks like a forest that Snow White or Sleeping Beauty would walk through. DelRae Roth: Thank you so much for this amazing post. Jillie: What beautiful, atmospheric photos. I can almost smell the woods, and feel the cool, moist air on my skin. I can never see bluebell woods now without thinking of the scene in Howard’s End in which Leonard Bast walks through them; E M Forster’s book is great, and the film captures its very essence and is lyrical, melancholy and true. That particular moment is the one that will stay with me forever. Victoria: Can you believe it, I have never seen Howard’s End, but now I really should watch it! OperaFan: Jillie – I was thinking exactly that scene in the movie when I saw Victoria’s pictures. It was truly an unforgettable scene. And I thought that England was the only place to find such scenery for it has become one of the images I have of the English countryside. Victoria: The first time I visited, I thought I was dreaming. It was completely unlike anything I’ve seen before. OperaFan: Muguets Do tend to take over everything. We have a corner of the house where muguets thrive in abundance (among the equally abundantly sprawling ivy) beneath some old shady oaks. They give such a show each May, then I have to beat them back as they try to invade areas beyond their borders. Ashley Anstaett: What a magical place. Thank you for sharing those beautiful photos! I can’t imagine how peaceful it must be to wander in those woods. Nikki: Such an amazing forest….nature is at its best healing us, and copying some of the healing qualities in perfumes and essential oils is a real gift. Blue flowers were symbols of Romanticism, the “blaue Blume des Gluecks”, translates the “blue flower of fortune/luck”. I find blue flowers very exceptional, they seem to belong to the sky more than to the earth, therefore the relationship with spirituality. Penhaligon’s has a sweet perfume called Bluebells…in a lovely etched flacon. As you know I live in Belgium (Flanders) and I’m truly touched by the fact you were impressed by this magnificent forest. Hallerbos means Hallerwood. I know this forest because of the fact many horseriders I know go exercise their horses in this marvelous place. It’s very popular amongst horse people you know. They even have their own trajects in it, to preserve the other beautiful things of mother nature. I know that you live in Brussels, so you can also go to the Forêt de Soignes, another enourmous wood very close to Brussels. As I received today an invitation from our Belgian Agency of Nature and Woods I will send it to you by mail. I often receive such invitations because I’m a “green journalist” in Belgium. It’s an invitation for the ‘ouverture’ of a new Bed & Breadfast at the entrance of the Forêt de Soignes. I will join a little translation for you. It takes place in the afternoon, so you can easily combine it with a walk in the magnificent Forêt de Soignes. After the official part their is a drink with delicious tapas made in Belgium. If you are interested let me know, so I will tell them that you go in my place. As you are asking about other preserved areas, their is also a great wood named “Bulskampveld”, located very close to Bruges in Flanders. They have an enormous garden full of aromatic herbs. I often go in summer just to smell them and to pick out ideas for my own garden. The Woods are full of marvelous old trees and there is even an old castle in it worth à visit. Also in the Bruges’area we have Tillegembos. A little juwel of his own, with also a little castle in it. These two Woods are public and very well kept by the Flanders government. Let my know if I may send you the invitation for the Forêt de Soignes. Annette Reynolds: This is lovely, Victoria. I have thousands of bluebells in my garden (none of which I planted) and they really do turn the place into a fairyland. Unfortunately, they’re very invasive, so once you have them they never go away. The bulbs settle themselves very deeply into the soil, so even trying to dig them out doesn’t work if you’re trying to clear a small spot to plant something else. Luckily, it’s easy enough to simply strip away the greens once they’re done blooming, and plant something on top of them. But they always come back… And then some. So if anyone wants to replicate something like this in their garden or lawn or woods, it’s very easily done. Annette Reynolds: My worst invasive plant story is with something called Oregon Shamrock. Beautiful plant. Impossible to get rid of once started. I bought one little plant and put it in a shady area in the back of the garden. Of course, our Northwest climate is the perfect breeding ground and it’s now carpeted a good portion of that back garden. Oh well. At least it’s pretty. OperaFan: Annette, are you Stateside? If so I may take you up on your offer. Since I already have 2 highly invasive vegetation cohabiting in my yard, a third won’t make much of a difference. rainboweyes: Yes, it’s like a fairy tale indeed – an enchanted forest. What a peaceful, atmospheric place! This blue carpet is absolutely amazing. Our forest is full of white anemones now but they don’t look as spectacular as bluebells. Ariadne: Stunning post and pic’s and so many shimmering recommendations for basking on a flowery mead! Check out the Unicorn tapestry at the Cloisters in Manhattan http://www.metmuseum.org/collections/search-the-collections/467642. Victoria: Oh, I love this unicorn tapestry! The Netherlands and Belgium were famous for their tapestries in the Middle Ages (and there are still factories and artisanal shops operating), and there are so many beautiful examples. But this unicorn tapestry as well as the The Lady and the Unicorn tapestries at Cluny Museum in Paris are my favorites. Thank you for reminding me about it. kate: what a beautiful place! 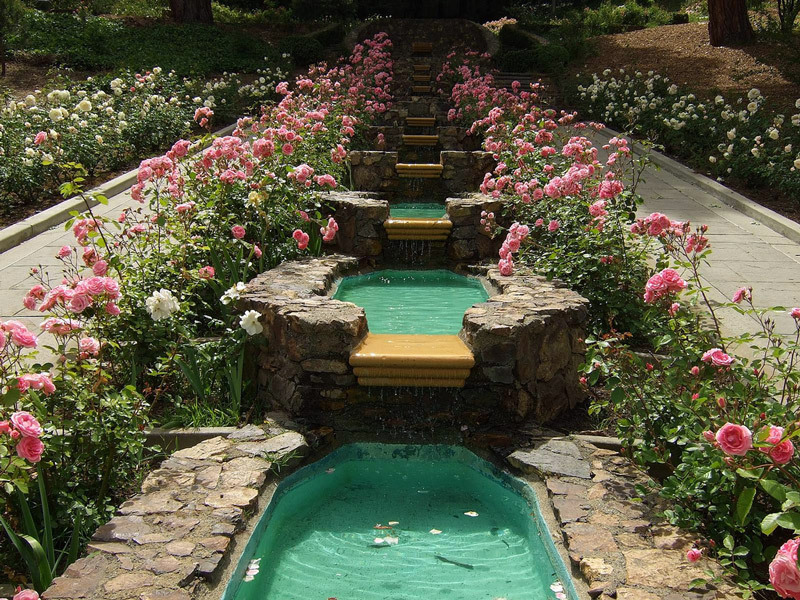 it isn’t a nature park or preserve, but i live near the rose garden in oakland, CA, and it is nice to go there on a warm day and inhale the scent of the roses. it has steps and circular walkways and a fountain with the bottom painted blue like a swimming pool. carole macleod: Over the years you have posted many beautiful images, but I think this is now my favourite. It’s mesmerizing-unreal! There are some old growth forest in New Brunswick, and it’s a treat to be under their canopy of leaves. It seems as if there is more oxygen there than anywhere-plus there are wild violets. Even one tiny violet is noticable, amongst moss and green trees. I think it’s one of the reasons Dans Tes Bras means so much to me-it’s like that image, in a scent. OperaFan: I do remember the first time visiting the SF / Oakland Bay Area and experiencing the smell of eucalyptus trees everywhere. But an even more beloved place of smells for me is Yosemite, with its variety of pines, sequoias, cedars, and hemlocks, not to mention waterfalls, rivers, lakes, and sun baked granites. Every different area and elevation is its own ecosystem and has its own smells. It’s the one place where I refuse to wear perfume in order to maximize the olfactory experience. Victoria: When I first heard about forest bathing, I thought that it was a terrific way to describe the forest walk. Austenfan: Lovely pictures of beautiful flowers. I won’t have time to visit this year, but will bear it in mind for another year. As I live more or less on the edge of a town, the countryside is only a short bicycle ride away. As it has been very dry the woods themselves don’t have much of a smell at the moment, they are much more fragrant when wet. 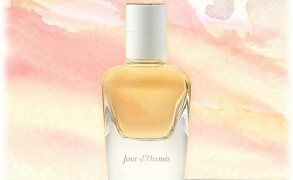 Victoria: Whenever I think of a perfume that embodies spring, Le Temps d’une Fête is one of my first choices. I’m now imagining your garden all awash with daffodils! Hallerbos is worth a visit, because it’s really quite spectacular. In some parts of the forest, you see nothing but blue in all directions, and it feels dream-like, like it simply can’t be real. If I had time, I would have gone there even more often this season. Anne of Green Gables: Wow, the photos are spectacular! Thanks for the pictures and the info, V. Forest bathing is also a common practice in Korea. The health benefits are known to come from Phytoncide, which are antimicrobial volatile organic compounds emitted by plants and trees. Now there are commercial products with phytoncide that you can spray in your room. My dad actually brought one for me recently. I’ve been spraying it on my bed before going to sleep and it’s wonderfully relaxing. Nonetheless, nothing is like the real forest bathing.